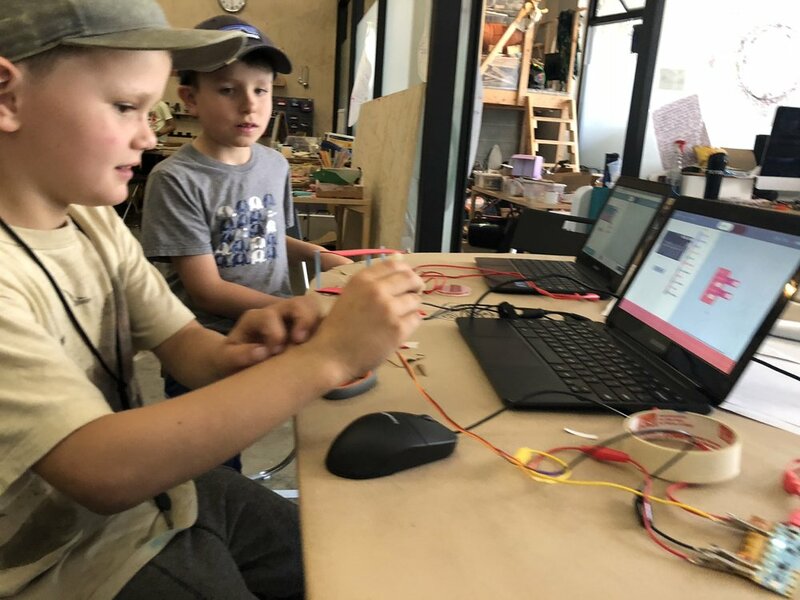 Chibiopolis Wasn't Built in a Day - Crafting with Code 4.5 — Wonderful Idea Co.
For the last two days of crafting with code summer camp, we worked on an extended project with more freedom to explore different aspects of physical construction and more complex coding. After the success of the last week's compurational creatures petting zoo, we tried to develop a open-ended theme for a collaborative installation. Taking the lead from some of the most successful projects the first go around, we introduced the theme of creating a tiny city called 'Chibiopolis' full of electronic creations. Our honorary mayor Liora explained the parameters of the project (each one needed to incorporate a switch, a servo motor and a LED element) and tinkerers got into groups to come up with a blueprint for their additions to our village. This week we put in more scaffolding with the RGB LEDs and servo motors so many groups had initial ideas about how to add them to their projects. Some of the initial ideas for chibiopolis included an airport, fast food restaurants, a library, a haunted house, a hot dog cart and a vending machine. It was awesome to see groups moving back and forward from the laptops and chibichips to box cutters, hot glue guns and soldering irons. 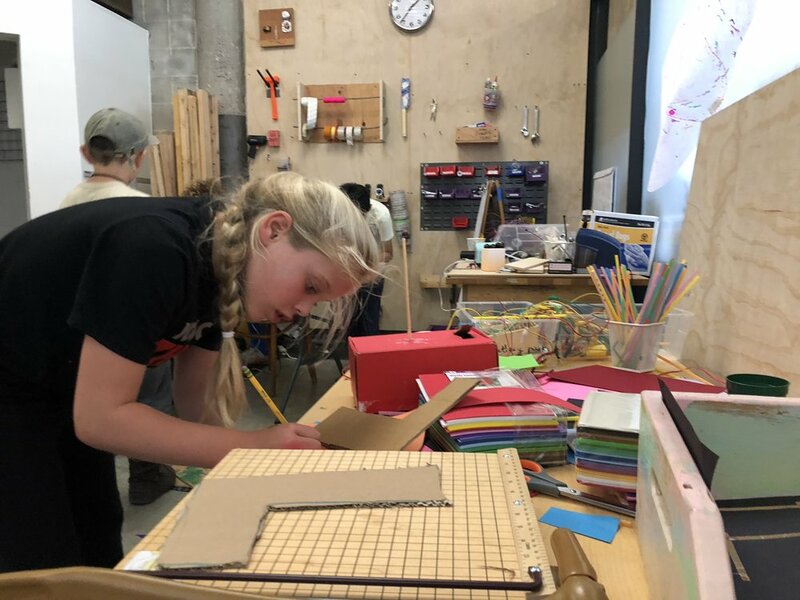 As they worked, campers moved around the room, found spaces to build and shared ideas with eachother about their projects. At the end of thursday afternoon, we had made some progress, but everyone still had a lot of work to do. On Friday we continued working right from the start of the morning. Each pair worked to put the finishing touches on their projects and add more elements. There were some amazingly complex ideas that campers worked to explore. At the end of the day we invited parents, siblings and friends in to check out the progress on the projects. Even though everyone could have used a bit more time on their projects it was super fun to get to share the entire collection of projects with our guests. Once again it was imporatant that the group worked on project that was arger than each individual elements. There was a good combination of intrinsic motivation to make each creation interesting, but groups didn't feel too much pressure to make it perfect. I'm sure that we'll continue to explore this theme of Chibiopolis for future workshops and camps. This was the final project for our summer camp prototype this summer. We learned a tremendous amount and had so much fun working with all the campers. We'll continue to share activity guides and lessons learned from the experieces as we develop more programs to explore art, science and computational tinkering.